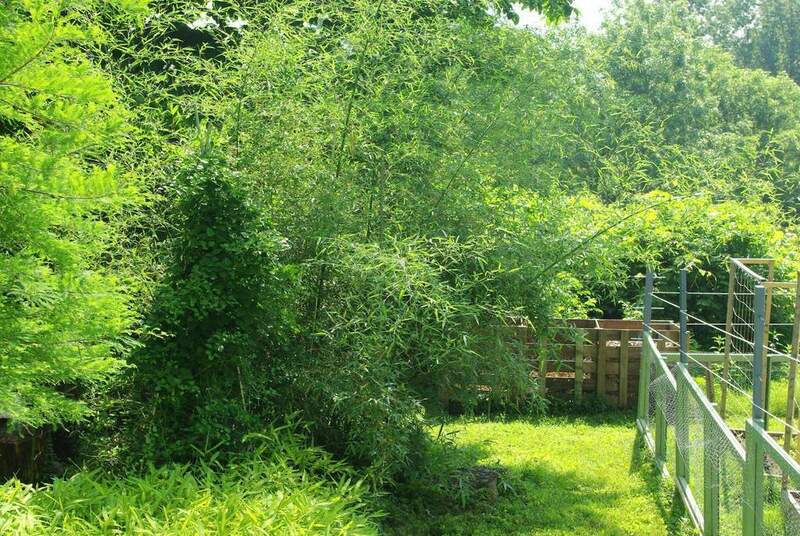 I've had to support floppy bamboos before, mainly because they were still young and hadn't produced the thicker culms (canes) that are able to stand tall and straight most of the time. Today I have to support a bamboo that produced some nice thick culms this year, but they're leaning too much for my liking. 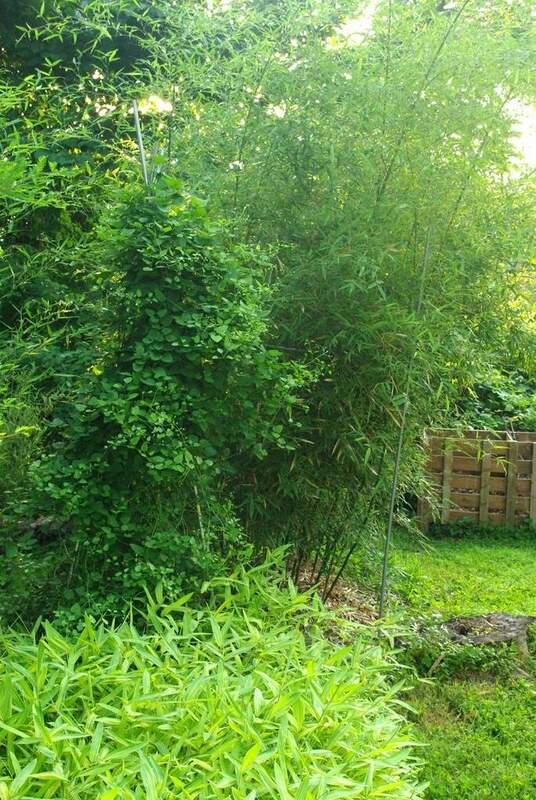 This is my Phyllostachys glauca 'Yunzhu' bamboo, and although it's difficult to see in a photo, there are culms sticking out all over the place, not staying upright as I'd like them to. Not very neighborly. So I'm going to build a simple "cage" with metal electrical conduit and hose clamps. 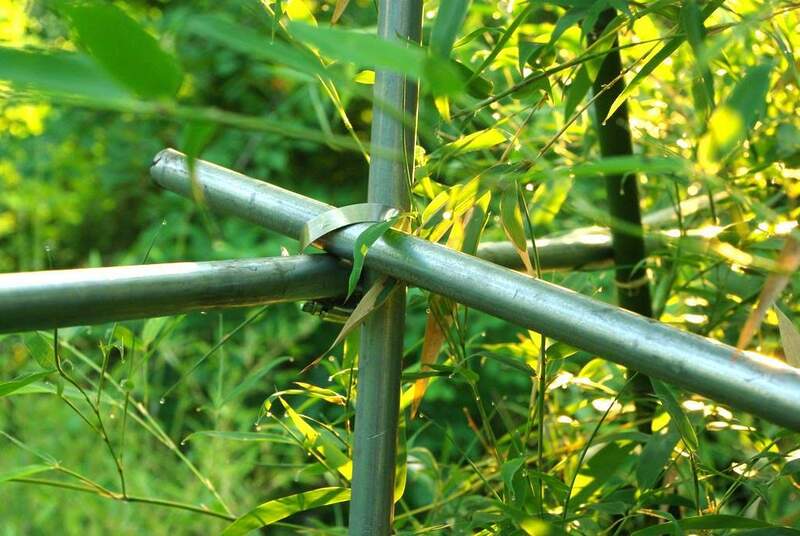 I'll put a pole into the ground at each corner of an area that encompasses the bamboo, then add horizontal poles that will not only support the leaning culms and force them more upright, but will give strength to the entire "cage". The problem on this one end is that there are two old elm tree stumps, and although they're starting to rot, their thick roots make it hard to find a spot to push the poles far enough into the ground. After a dozen or more tries, I finally found a reasonable spot. My idea was to tighten the clamps enough to allow me to slide the poles up to the correct height (about 6'), but the weight of the leaning culms made this difficult -- so my neighbor held the pole while I positioned and tightened the clamps. I had to loosen the clamps again when I was ready to put on the shorter side poles as the "box" is roughly 9' x 4', and in one case I used too small of a hose clamp -- it wouldn't fit over three poles to make the corner -- but the clamping was relatively easy work. These are important to leave in a new planting for a couple of years -- the plant needs every leaf it can get if you want it to size up quickly -- but they are bushy and unattractive, so it's time for them to go. 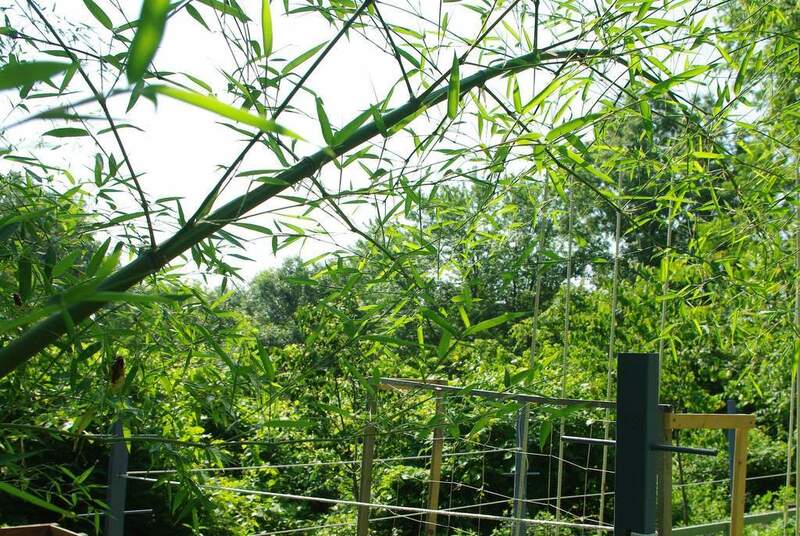 I'm just hoping that once the new culms leaf out the "cage" will be strong enough to withstand their weight and any storms we have this summer. One note: These culms have been leaning like this for a few weeks, but I didn't want to support them in this way before now. 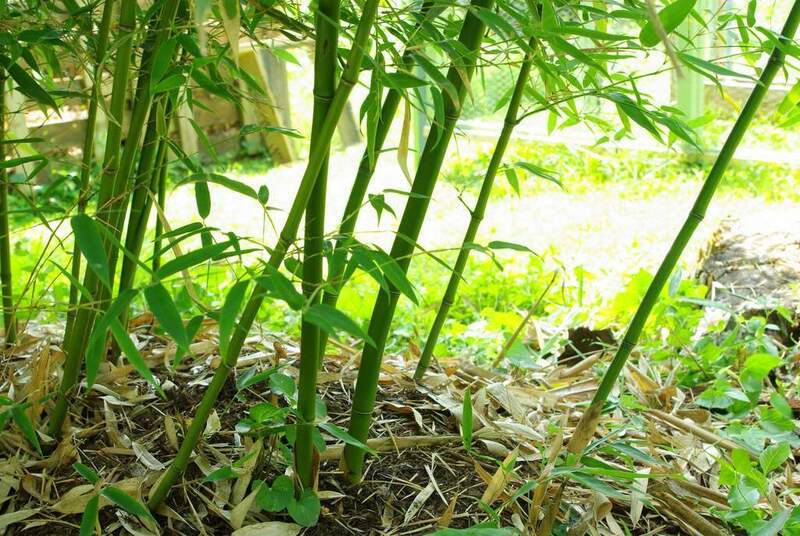 New culms are "woody" but don't really have the strength that they should -- they haven't "hardened" yet, and bamboo culms take a few years to reach optimal strength. So new culms breaking in windy conditions is not uncommon, and adding the horizontal supports could have increased the likelihood of a breakage at the point of support. That was a project that took less than an hour (for once!) and really made a big difference in this part of the garden. I love projects like this -- why can't they all be this easy? That's a very creative solution! 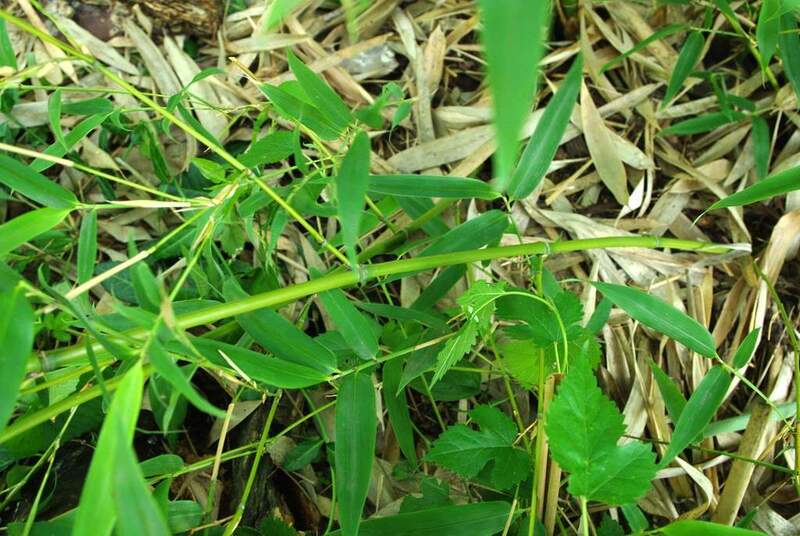 Is this bamboo variety particularly prone to leaning? Stump grinders are good for getting rid of old tree trunks. Our garden had eight of them and the machine reduced them to sawdust in no time. 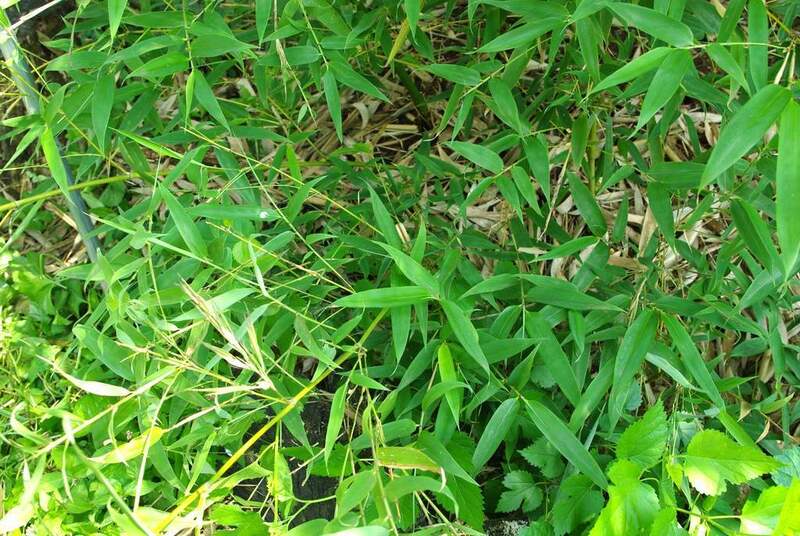 May be difficult if they are surrounded by bamboo, however. 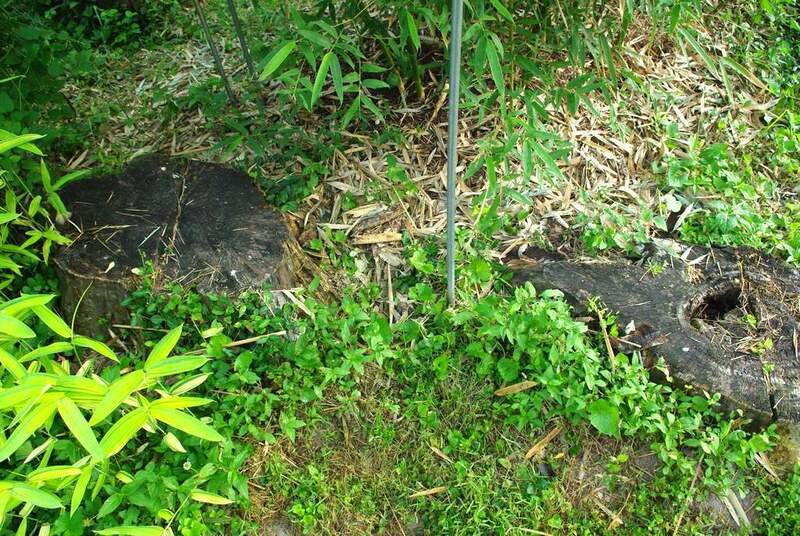 Janet: the problem is the long, thick roots that lead from the stump. Grinders don't typically get those. I've considered grinding these out though. Gerhard: I think so, at least while young. I've read it gets more upright with age. 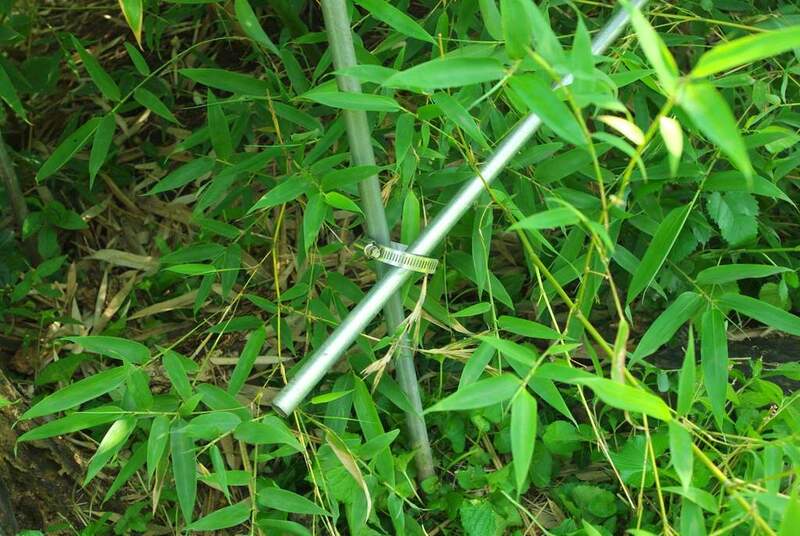 That's quite a bit of lean for a bamboo of that size. I'ma guessing it's probably phyllostachys glauca since I can't really identify it. I guess it's due to the angle in which the shoot came up. Last year, my parvifolia made all of it's shoots like that, sometimes at an angle steeper than 45* which never corrected themselves, but it's making mostly straight ones this year. Other species will often straighten up if they end up emerging at an angle. Don't forget that you can tie the canes together while soft and then force then to grow in another direction, before they pull up enough silica to harden off.